The work we do at Camp Hardtner matters. Deeply. You’ll be hard pressed to find a better—or more challenging—job in the world or a more rewarding ministry. Working and living intentionally in community will push your limits and you are sure to grow tremendously: spiritually, personally, and professionally while you impact the lives of our campers. Camp Able is specifically designed for persons with special needs. It is NOT about disabilities, but rather about ABILITIES! Christ has called us to love God and to love our neighbor as He has loved us—without conditions or limits—it is in celebration of that perfect love that we come together at Camp Able. Must be 16 years of age or older at time of Camp Able start date. Must be available to serve for the entire length of the session, including the pre-camper arrival training and planning. Must submit health history record and examination form prior to arrival. Those under 18 must have signed consent form from a parent/guardian. Those over 18 must complete a background screening. Must be able to complete online child abuse awareness and prevention training (Safeguarding God’s children) prior to first day of Camp Able. Must complete Safeguarding God’s Children sexual abuse awareness and prevention training online prior to Camp Able. 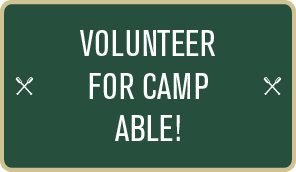 Camp Able Volunteers must attend the pre-camper arrival training and planning, as well as the entire session. The dates are July 15-July 21. Volunteers are essential to the success of the Camp Able program. Volunteers serve in a one-to-one ratio of volunteer to camper. Each volunteer provides assistance, physical or otherwise, for their assigned camper and is expected to facilitate the safety and enjoyment of the camper throughout the duration of the program. During Camp Able, campers take part in several different activities i.e. swimming, arts and crafts, talent night, and much, much more. What is not easily expressed through words can be read on the camper’s faces—filled with amusement and delight. Each camper, faced with their own set of circumstances, work through their challenges to take part in a camp that allows them to have fun; learn new things; and most importantly, just be an ordinary person. Set an example of living the Gospel of Jesus Christ on a daily basis. Demonstrate strong moral and Christian values consistent with the Episcopal Church’s teaching. 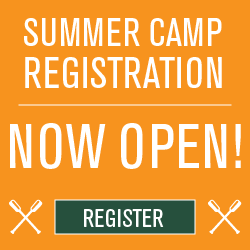 Willingness and ability to assist campers with all activities of daily living, including dressing, basic hygiene practices, bathing, and providing assistance during mealtimes (Formal training will be provided to ensure that volunteers are provided the knowledge and skill to complete these potentially unfamiliar tasks). Willingness to live in a camp setting and work irregular hours with limited time off; and daily exposure to the sun, heat, and animals such as bugs. Stamina to carry out camp program in hot and humid climate over extended period of time. Physical ability to run, jump, play, and negotiate hilly terrain and trails; and walk several miles per day. Physical ability to respond appropriately to situations. Must be able to assist campers in an emergency (fire, evacuation, illness, or injury) and possess strength and endurance required to maintain constant supervision of camper buddy.